Walsall’s economy has an annual output of £4.77 billion and provides around 120,000 jobs. 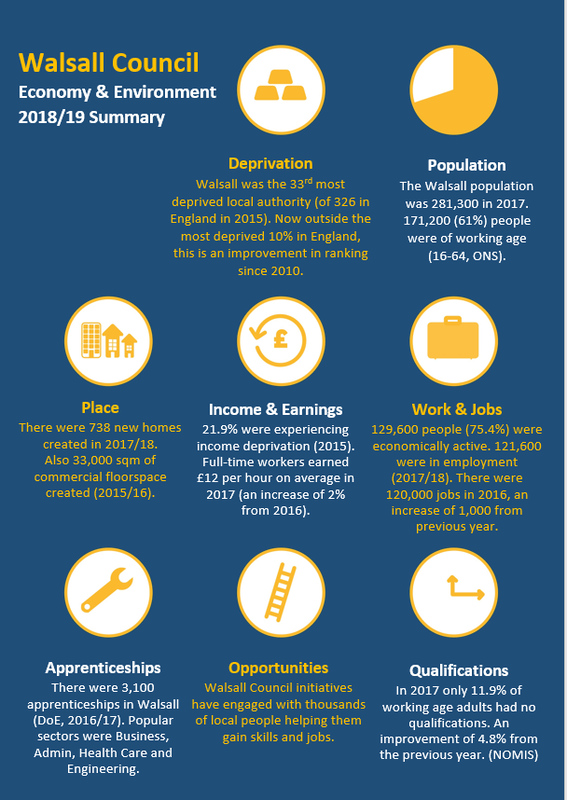 The local economy supports a steadily increasing resident population of over a quarter of a million, with three in every five people being of working age. However, only two thirds of working age residents are in employment, and for those in work, earnings are below the national average. In June 2017, we took a Cabinet decision to further invest in our Economic Growth Programme, which has successfully sustained resources against our economic ambitions despite budget challenges. We have reinvested £2m in the services surrounding economic development and regeneration and extended the life of this programme for a further two years, to the end of 2020/21. The programme as a whole will see Walsall investing just under £15m of revenue funding over the next five years in our pursuit of inclusive economic growth. Our aspirations for young people and preparing the workforce of the future are in part driven by our economic strategy (Corporate Plan). The Black Country Consortium Partnership (BCCP) was established by the four local authorities in 1999 (a voluntary arrangement owned by local partners) and over time a mature culture of collaboration has been embedded across boundaries, organisations and sectors. The main thrust of its work has been to transform the Black Country economy from traditional to high value manufacturing, and to tackle the wider housing, transport and environmental issues necessary to underpin sustained recovery and growth. In 2003, a company limited by guarantee, the Black Country Consortium Ltd (BCCL), was collectively established to facilitate this strong and successful collaboration. Despite several changes in local authority political leadership since that time, including in Walsall, the Black Country has been constant and successful in driving through its vision for the future.